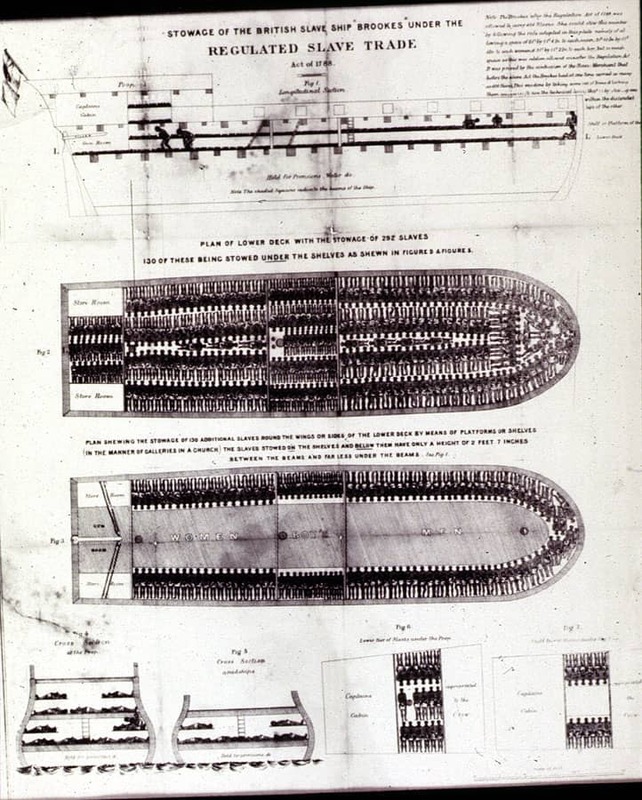 One of the most famous images of the transatlantic slave trade, this image of the slave ship Brookes shows each deck and cross-sections of decks and “tight packing” of captives. The image graphically illustrated how inhumane conditions were for slaves in the Middle Passage. First published by British abolitionists in 1788, the diagram depicts a vessel of 400 slaves packed in cheek by jowl, some with just 2 feet and 7 inches of headroom. The Regulated Slave Trade Act of 1788, which was designed to reduce deaths due to overcrowding on slave ships, allowed each man 6 feet by 1 foot 4 inches of space (women and children were granted slightly less room). In the years that followed, the Brookes drawing was republished in books, on broadsheets, and as posters all over Britain, France, and the United States, and came to symbolize the inhumanity of the slave trade. It is impossible to know how influential the image was in swaying public opinion against the slave trade and slavery more generally. Yet, as abolitionist Thomas Clarkson argued, the “intelligible and irresistible” way it conveyed information made it an especially evocative form of anti-slavery propaganda.